I was diagnosed with anxiety for the first time in third grade. Before that, my parents thought that I was just a shy, overly-rule-abiding young girl. I don’t think they thought that my nervous ticks or tendency to be moved to tears because I didn’t write my cursive “A” just right in second-grade handwriting was OCD, or obsessive compulsive disorder. However, as I’ve grown up, I’ve truly learned how negative my compulsions can be, how they can debilitate me throughout the day, and how they can slow me down when it really counts. Most of the time, my OCD appears at school. For me, school isn’t “prison” like the other kids say; I’ve always loved school, loved learning, and loved my friends. However as I’ve gotten older and everything points to this looming idea of college, school has turned into a place where I am trapped in my mind, with thoughts of what society wants me to be, expects me to achieve, swirling around in my head. The emphasis on getting perfect grades while balancing as many extracurriculars as possible, just so one college admissions officer looks at me and wants me in their school is a lot for me, as a really high achieving girl with dreams of going to Yale. My compulsions come from a need for perfection, which is frustrating, as everyone else sees me as an annoying perfectionist who needs to “loosen up.” They don’t understand how hard it is for me to “loosen up,” because my OCD is woven into my framework. Honestly, I cover my OCD and anxiety like a pro. When I switched elementary schools, nobody but my fifth-grade teacher knew that it was because the strict Catholic school system had finally pushed me over the edge. I don’t think I’d have two dyslexic students assigned to copy my notes if they knew that I have to rewrite a page if I smudge the ink or tear the paper in the slightest way. It’s really hard for me to cover up my OCD and anxiety, especially when I’m not around people I trust. Let’s stop telling people that they’re perfect, or that they need to be perfect. Let’s stop pressuring ourselves to be perfect. Perfect isn’t something to aspire to—it limits us to what we are already doing instead of pushing us to take risks and step outside of the box. Once we stop aspiring to perfection, we will be able to see all of the things we have yet to accomplish, all of the adventures that we can still go on, and all of the experiences that we have not yet had. Strive not for perfection, but to be your best self. No matter what, stay perfectly imperfect! 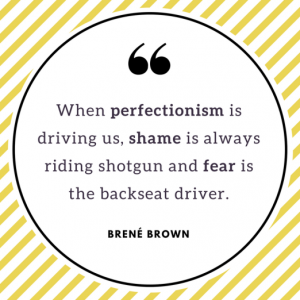 At what moments in life does perfectionism feel like it causes you the most stress? What are your strategies for negotiating it? Share with us in the comments!